If Barzaari sounds familiar, you are not wrong. There is already a Barzaari in Marrickville and Miss America and I had visited there years ago when it first opened. Miss America's flatmate works at Barzaari and let him know that there is now a new Barzaari in Chippendale. It would be the perfect central location for dinner with Miss America, Queen Viv, Ivy, Ryan, Mr NQN and I. 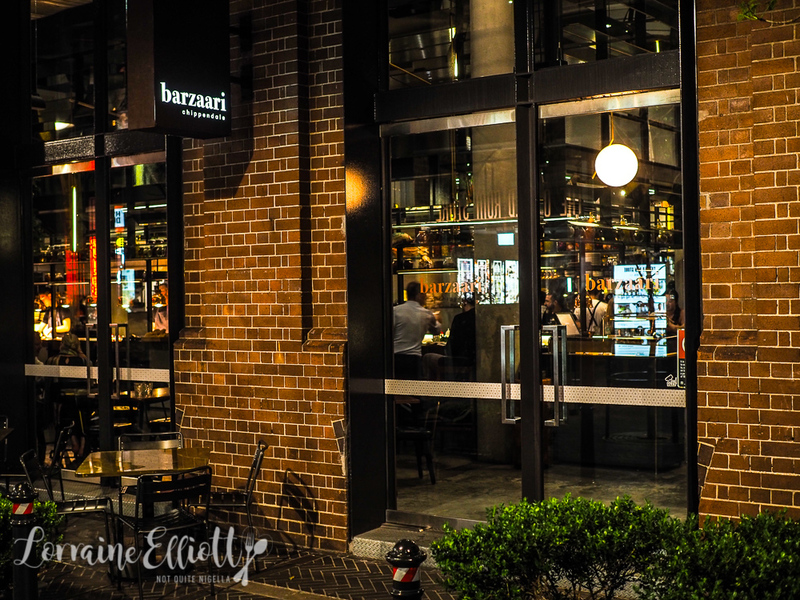 The chef behind the pass at Barzaari is former Quay chef Darryl Martin who has partnered with his Barzaari Marrickville business partner Andrew Jordanou as well as Singapore businessman Loh Lik Peng. And while the Marrickville Barzaari will remain, the menu at the Chippendale branch is a slightly more upmarket offering. 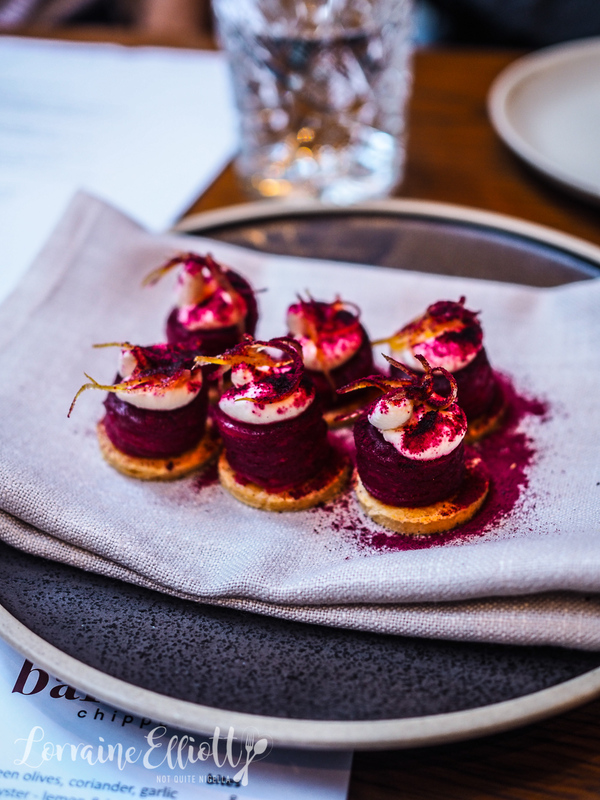 Our meal gets off to a delicious start with these beetroot amuse bouches. This is sweet and slightly vinegary beetroot on crisp biscuit with dried beetroot powder on top. Then comes another bite from the kitchen. The flathead felafel fish finger isn't on the menu but I hope it ends up there as they are such a tasty mouthful (or two). 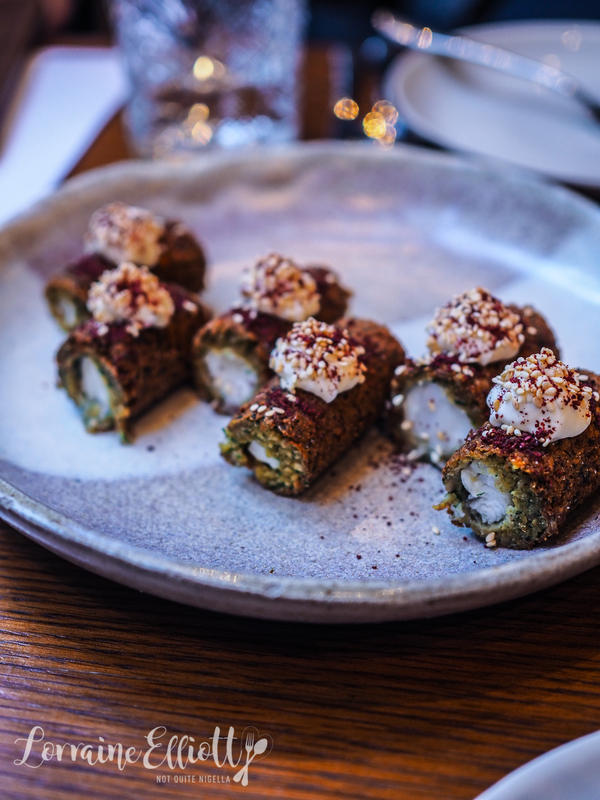 They are fingers of flathead wrapped in crunchy felafel with aioli on top sprinkled with sumac and sesame seeds. They are a resounding hit with everyone. 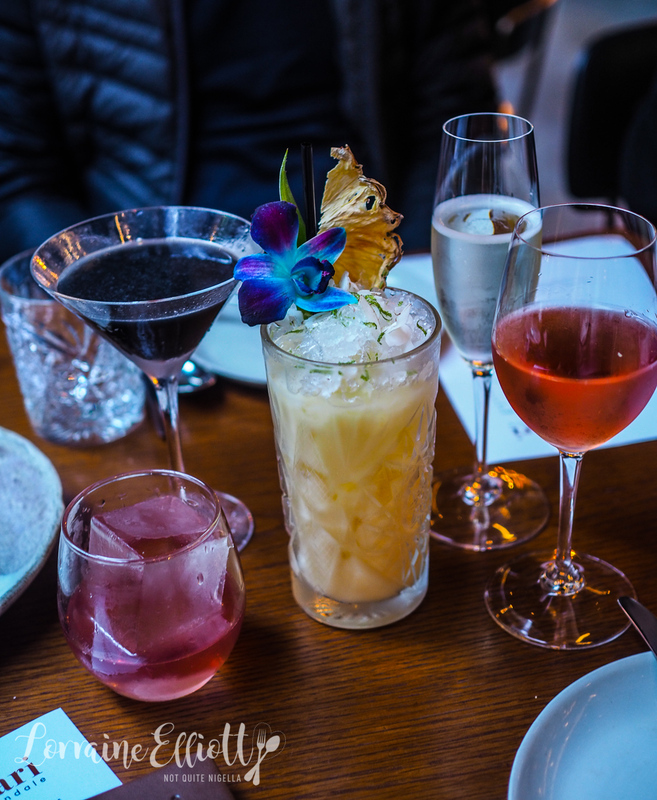 We order a round of cocktails for Ivy, Miss America, Mr NQN and I (Queen Viv has bubbles and Ryan is on water due to jetlag). My pick is a Black Betty as I was drawn to the name. It's made with mezcal, blackberry, mandarin, rosemary, lime and agave. Miss America has an Orange Orange with Blanco Tequila, spiced honey, orange lemon and a cute little ice cup filled with pomegranate arils (there was a misunderstanding and they accidentally brought him an orange wine which is pictured above). 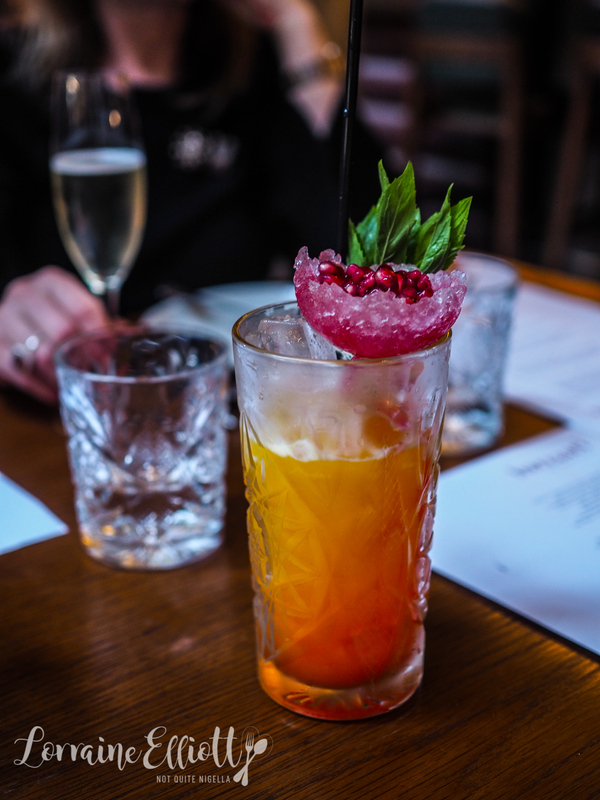 Mr NQN has a Pineapple Hill with rum, spiced pineapple jam, mango, coconut cream and lime but my favourite is Ivy's Purple Confusion with Pisco, blueberries, mint, vanilla and lime. And yes we are those people that pass around cocktails so everyone can try them. Although there are lots of interesting small bites in the first section, we are unable to resist starting with classic bread and dips. We order two lots of the bread. 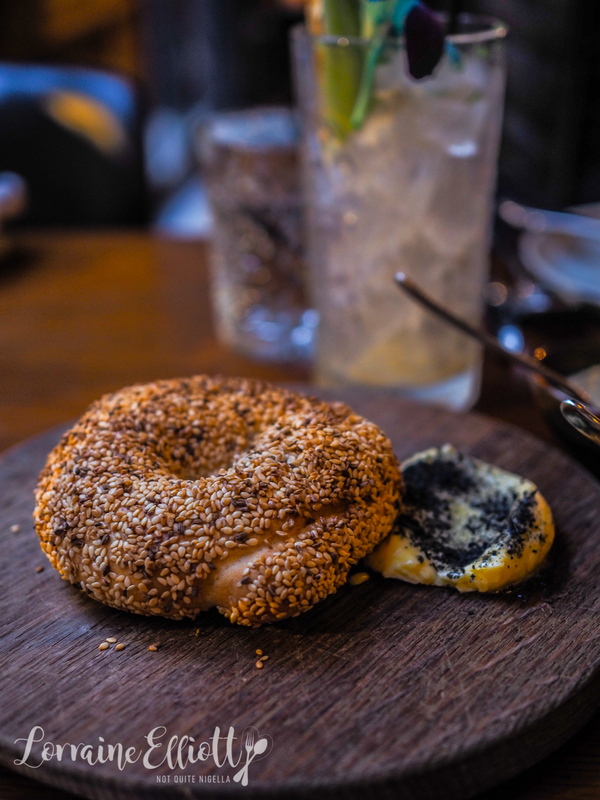 There's a puffy pita spread with butter and black sesame seeds and a koulouri which is a round of sesame dusted bagel shaped breads not dissimilar to Turkish simit. This comes with cultured butter and black salt. 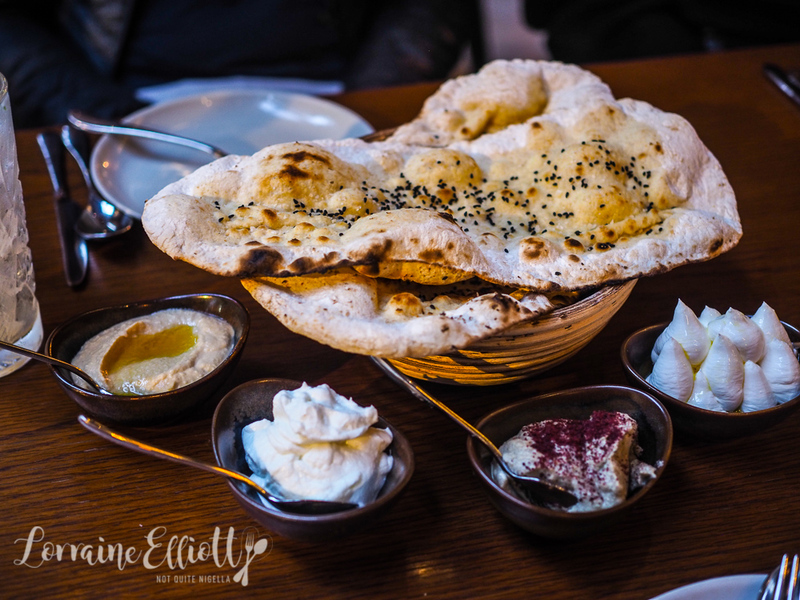 We pair these with one of each of the dips: labne, smoked eggplant, hummus and toum. I think we could have all happily eaten a whole bowl of garlicky, fluffy toum ourselves. The breads are also wonderful, both served warm and it causes Miss America to warn everyone to not fill up on bread. All the while while we are filling up on bread of course. We ordered two items from the smalls section which are entree sized dishes. 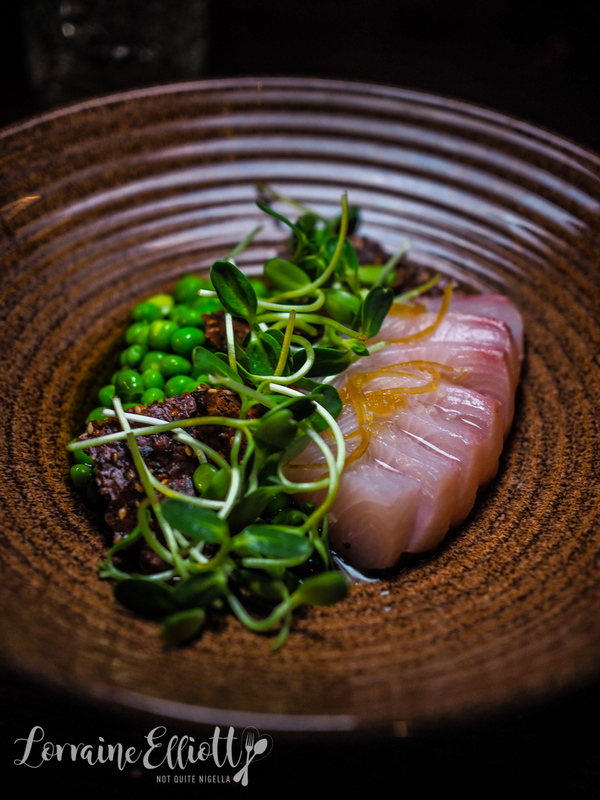 The raw kingfish is topped with fresh, sweet peas, lemon jam, basil, felafel and sunflowers. It's a light, refreshing dish courtesy of the lemon jam and the kingfish. The last time we ordered pig's head Ryan kvetched about it and said that he would never have ordered it. So I noticed that when Ryan asked Ivy what this dish was she answered, "Pork" which is smart because you don't want to set him off about pig's heads. The zalatina is one of my favourite dishes. 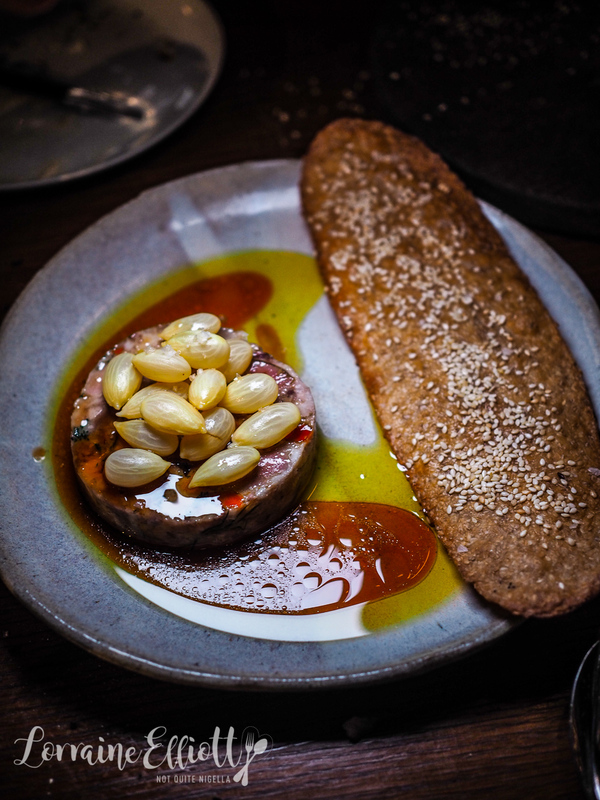 It's slow cooked and pressed meat from a pig's head served with green almonds that have a lovely pop to them, olive oil and a sweet, spicy sauce and a crisp flatbread. It's rich and gorgeous and the sauces add a sweet element that goes so well with the pork. I always get excited when I see beef short rib on a menu and this one is a beauty. 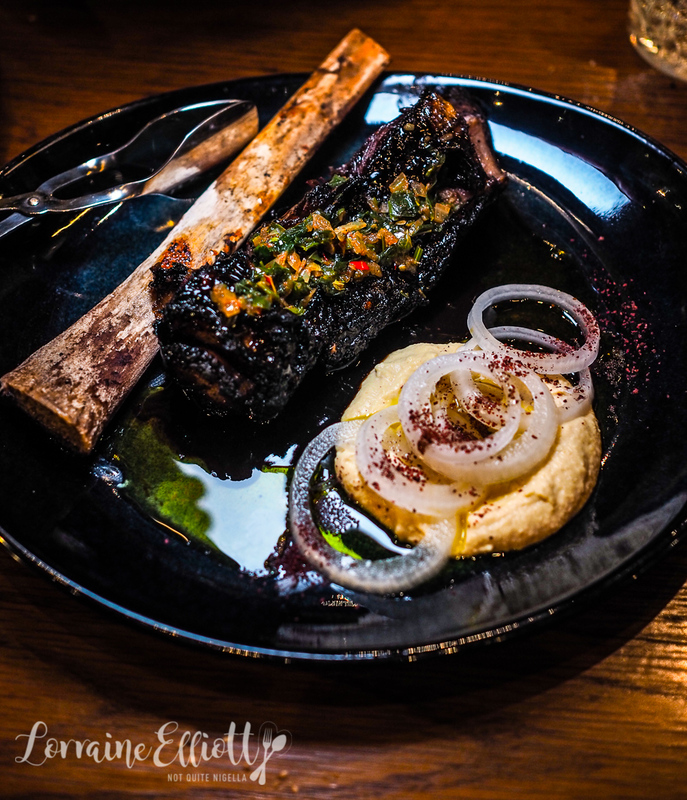 The soft beef rib is topped with chermoula and has hummus on the side with salted sumac white onions all providing the unctuous meat with depth and contrasting flavours. I don't usually order duck breast but the waitress really recommended this and I'm glad that we listened to her. The duck breast is tender with a lovely crispy skin. 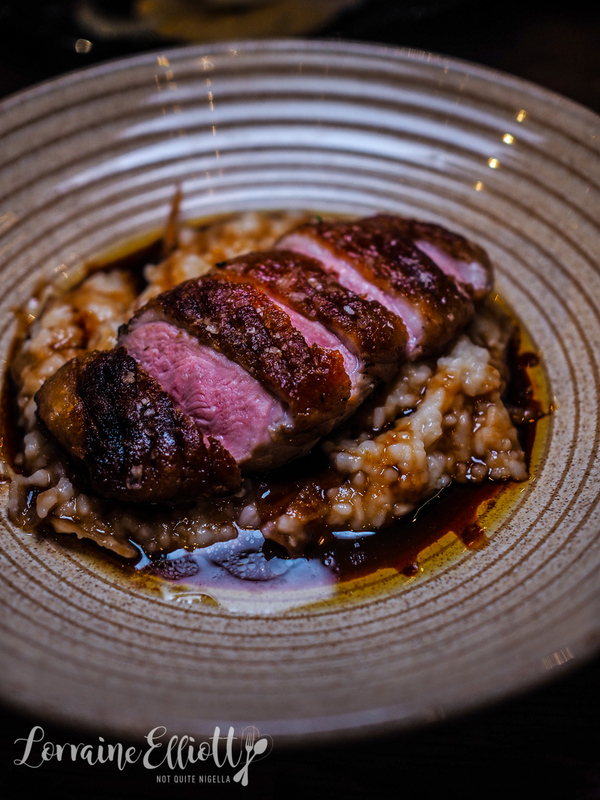 It comes as five slices of skin-on duck breast on top of a bed of Gazan rice porridge, bread and brown butter and Commandaria (Cypriot dessert wine similar to port) that gives it a sweet element that is so moreish. I have to admit I sometimes order things for the name - the Black Betty cocktail for one and this mother in law salad being another. 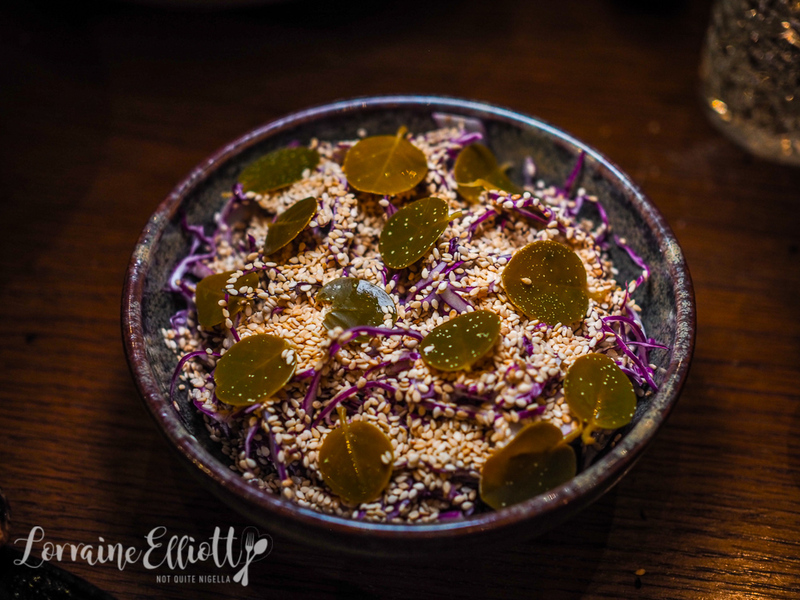 And while it's a simple enough concept, everyone loves this simple salad made with purple cabbage, white sesame seeds, maple mayo (can maple mayo be a thing everywhere mkay?) and caper leaves that have a very similar flavour to caperberries. It's creamy, crunchy and piquant at the same time and the perfect side to go with meats (and I want to make a version of this to go with Christmas dinner, yep I've already got my menu planned). 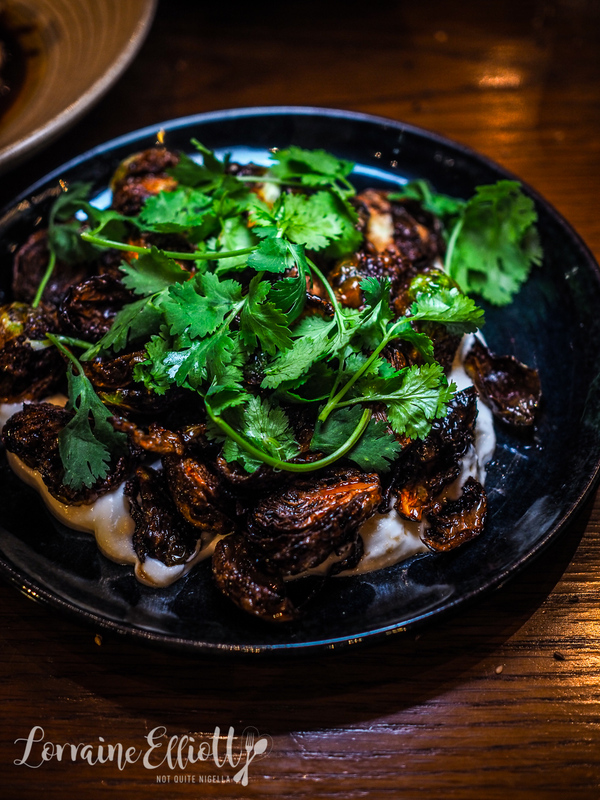 The Brussels sprouts is a generous portion of crispy, halved Brussels sprouts on a layer of garlicky toum with molasses and coriander. This is also a fantastic side dish although slightly richer than the salad. It's dessert time and have I mentioned how excited I get when I see a food trolley? Especially when its a sweets trolley. They wheel over the sweet trolley and we pick our sweets. 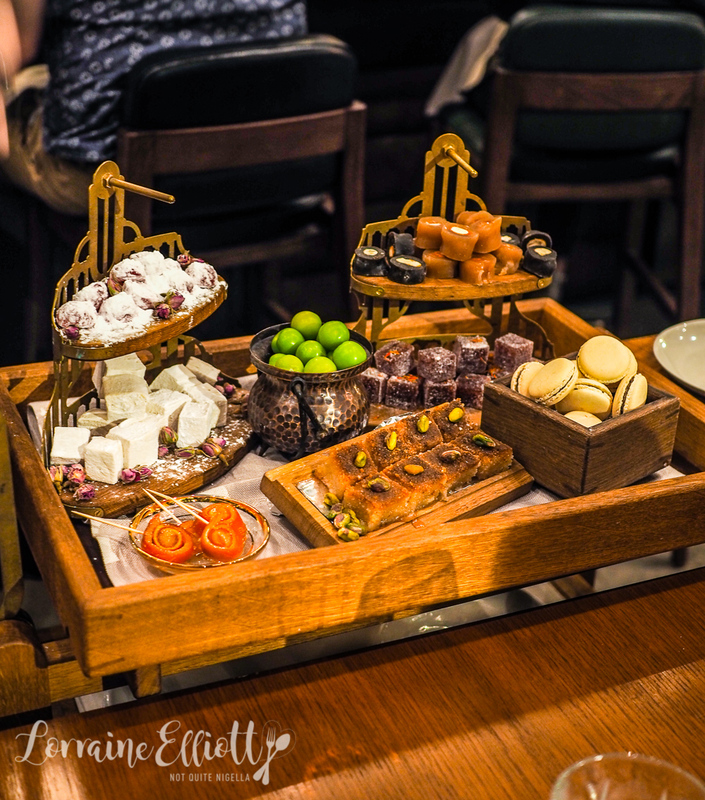 There's rose loukouma or Turkish delight, orange blossom marshmallows, sesame macarons, candied orange peel and raspberry pate de fruits and sour green plums. However it can end up being an expensive exercise with all of our petit fours costing $42 all up as each piece is $3 (Miss America thought that it was $3 per person rather than per piece). They're nice but perhaps next time I'd choose just a couple of them and then go more for desserts because they are more elaborate and interesting. Miss America and Queen Viv are too full to contemplate dessert but Ivy and I can squeeze in one. Since our waitress made excellent recommendations we went with her suggestion of the blistered buttermilk ricotta with a rose and rhubarb gelato, crumb and honeycomb. 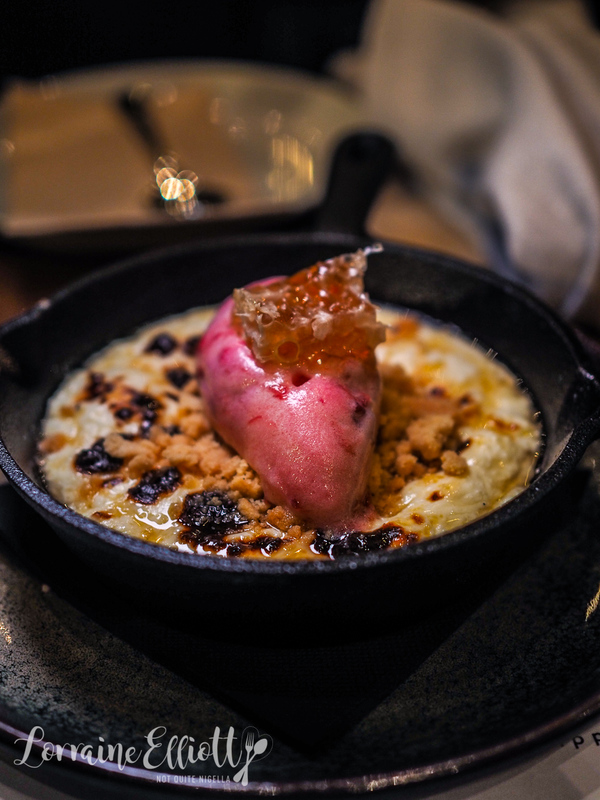 We love the interplay between the bruleed, rich cheesy base that reminds us of a knafeh and the rose and rhubarb gelato that gives it acidity and complexity. It's a gorgeous dessert and it gets a thumbs up from everyone. The honeycomb isn't even really needed in this. They ask if we'd like a coffee-namely their sandpit coffee where they heat up Turkish coffee over a flaming hot sandpit. We demur, it's too late to drink coffee (I would be wired for days I think). But of course it's not too late to go have a glass of wine elsewhere! So tell me Dear Reader, can you drink coffee at night without effect? And do you try other people's drinks or food or do you stick to your own? 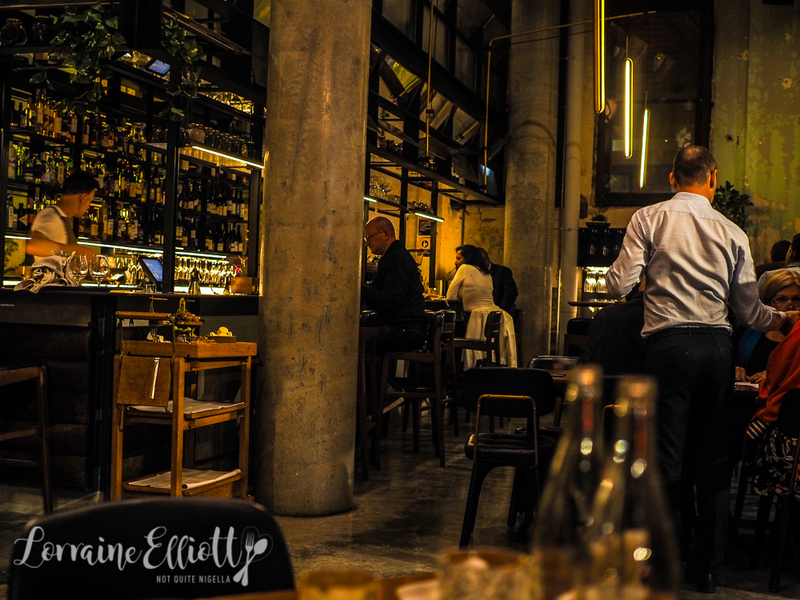 restaurantBilly Kwong, Potts Point & The Dessert Surprise! restaurantSushi Donuts: A Hole Lot of Fun! 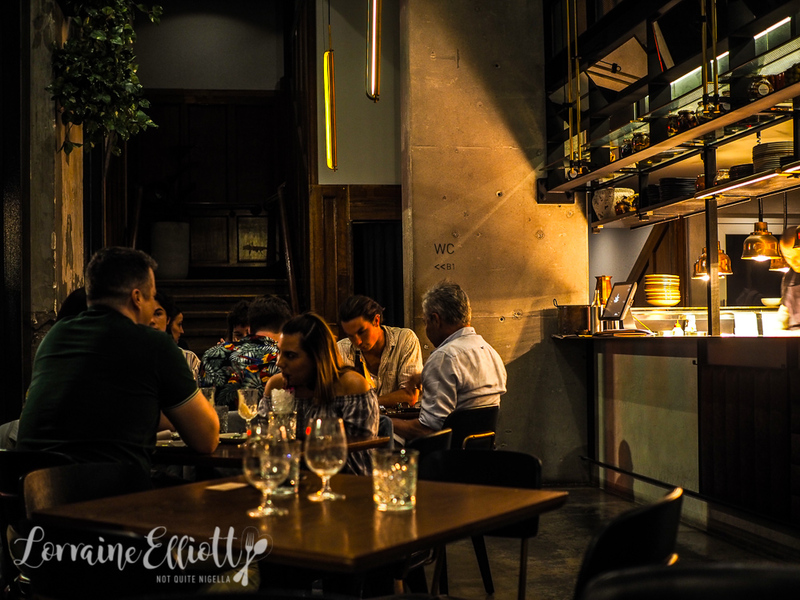 restaurant Billy Kwong, Potts Point & The Dessert Surprise! restaurant Sushi Donuts: A Hole Lot of Fun!